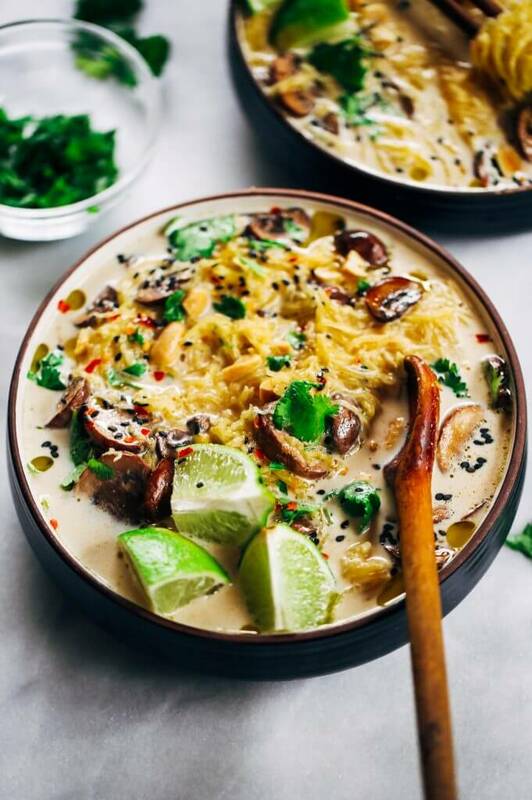 Whole30 and vegan spicy peanut ramen! 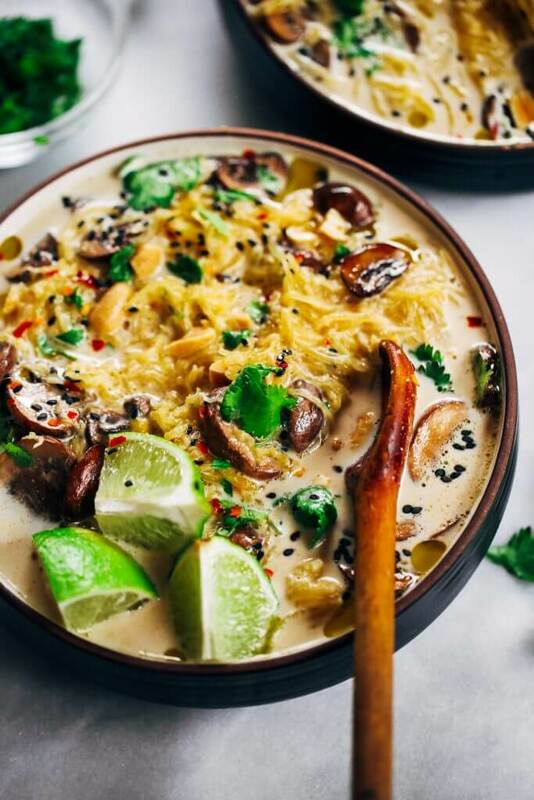 Fast and easy spaghetti squash noodles with spicy peanut lime broth. 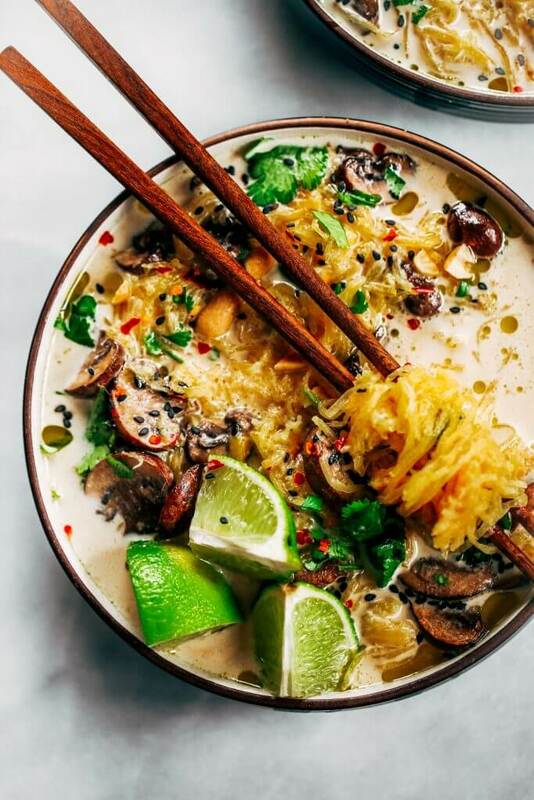 A healthy vegetarian ramen recipe for the whole family. In the mood for ramen. All the spicy peanut ramen that is. My brother and I would pile up on Top Ramen when we would visit friends or skiing… because ya know- Papa would let us have it. It still feels like a treat to slurp ramen to this day! Except this time, I’m going all out vegan, whole30, and paleo- keeping it clean. 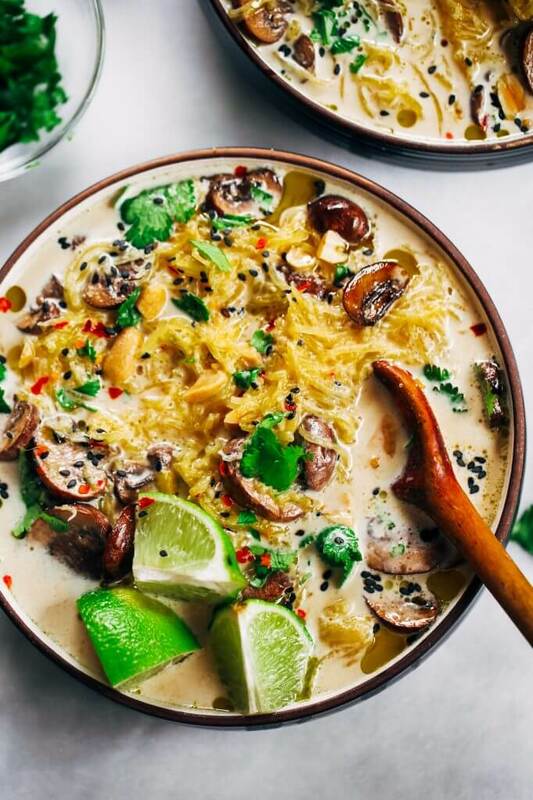 If you’re feeling the grains, you could sub the spaghetti squash noodles for regular ramen or rice ramen for gluten free. It’s so good guys… I might have a new obsession. I could eat this ramen for breakfast, lunch, and dinner; in fact, I did today, haha. The-most-yummy spicy peanut lime sauce that will make you drool. Now, this combo might not make sense right away, but trust me- it’s SO worth it!! It’s just sheer deliciousness and slurp-worthy ramen. The flavor profile here is mellow enough for skeptics, so if you’re not a spicy-foods fan, then you can downplay the red pepper flakes to your tastebuds. Okay, you’re ready for ramen now. Go make an extra big bowl! It’s absolutely freezing here- in the negatives, so I’ll be sticking with the allll warm foods this week. 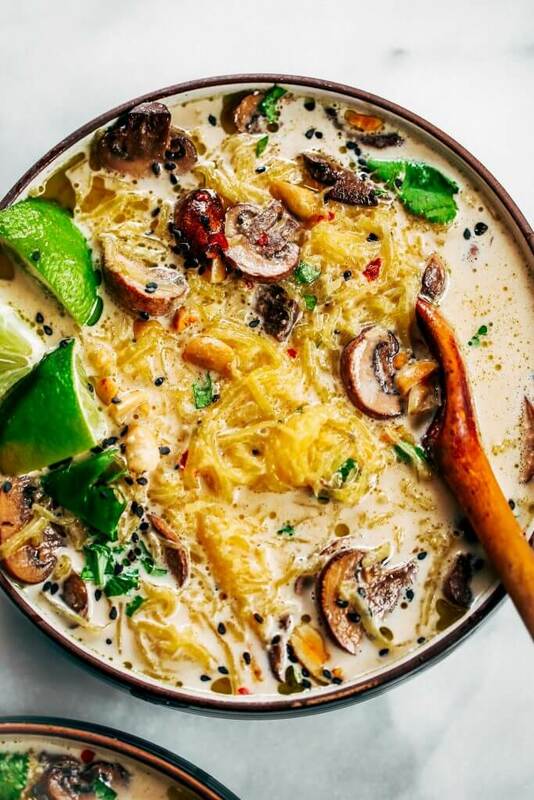 How to bake spaghetti squash: cut spaghetti squash in half lengthwise, use a large spoon to scrape the seeds from the center, lay face up on a baking tray, and brush lightly with olive oil. Bake on 450F for 25 minutes (cook longer for softer noodles). Then scrape the meat (noodles) from the squash with a large fork or spoon. In a fry pan add sliced mushrooms and a drizzle of olive oil. Saute until golden- stirring on occasion. Then set aside. In a blender or food processor puree ingredients for sauce until smooth. Then combine with vegetable broth in a saucepan and heat on the stove over medium heat until simmering, then remove and set aside. 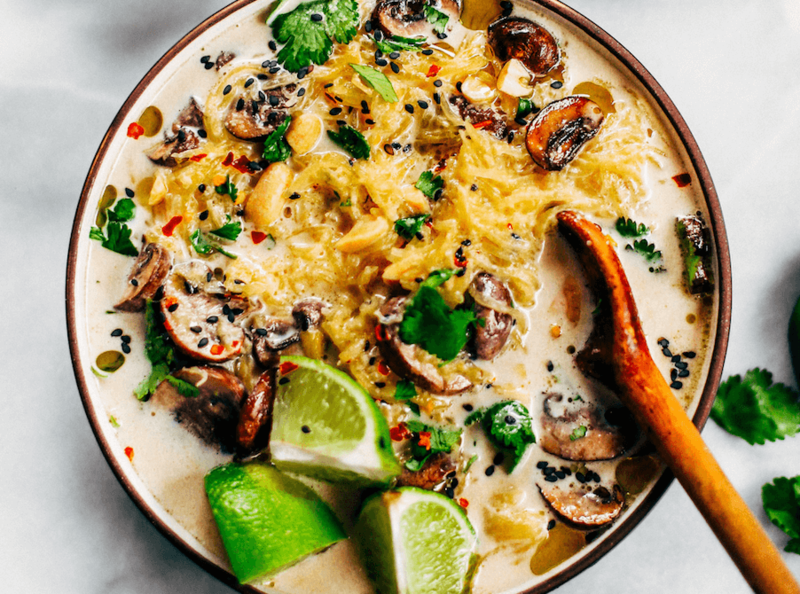 Add spaghetti squash ramen noodles and sautéed mushrooms to the saucepan and heat until it reaches eating temperature. Top with fresh lime juice/lime wedges, sesame seeds, cilantro, chopped peanuts, and red pepper flakes to taste. 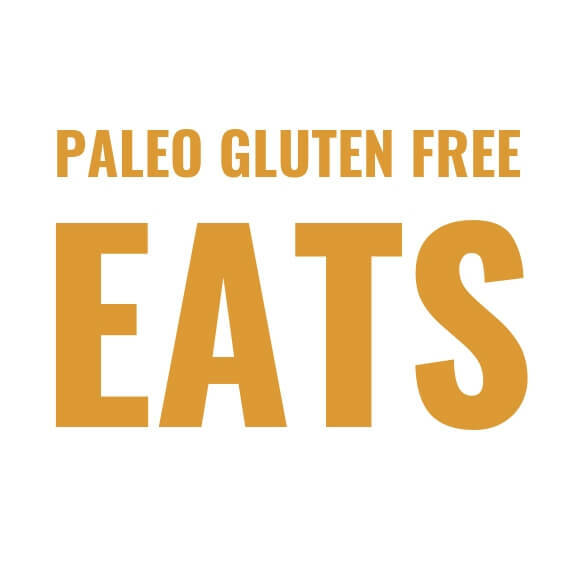 Hi Jill, that’s why it’s noted to use cashew or almond butter for paleo and whole30. 🙂 Enjoy! What would you sub the peanut butter for to make this whole30? Almond or cashew butter? This looks so yummy! But no peanut butter for paleo or Whole30?!?? Have you tried with another but butter? Made this last night, HUGE HIT! However I used unsweetened sunflower (seed) butter, as it tastes closest to peanut butter. I also used bone broth for more protein, added more green curry for a more intense flavor. Try unsweetened sunflower butter, you’re going to be amazed! Thanks for this awesome recipe. Great idea, thank you Jen! I am allergic to coconut, has anyone tried this with a different milk? This was INCREDIBLE! Not a flavor profile I’m used to making but WOW!!!! I used cashew butter and cashews, toasted some regular sesame seeds that I had on hand and was out of cilantro which would have been fantastic but still good without it. I would probably double the mushrooms since mine cooked down so much for the next time. And there WILL be a next time! Thank you! Great to hear, thank you Mary! 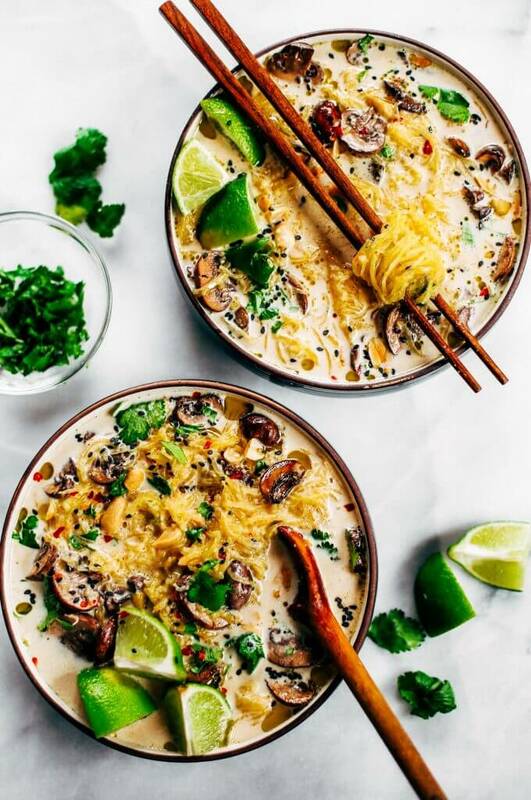 Would this work with zucchini noodles? Yes, that would work great Clare!